When adding or changing the algorithm of a Delta Q battery charger with the QuiQ Programmer, the software must be installed/launched onto a computer. 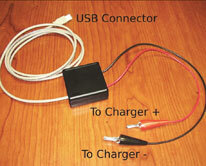 The QuiQ charger should also be connected to the computer so that communications can be verified. Watch this video to learn how to set up your Delta Q battery charger for JLG® OEM batteries. The QuiQ™ Series of battery chargers have been designed to provide reliable, quality charging for battery systems in electric drive vehicles. The QuiQ Programmer is the new field reprogramming software that enables you to add or change the charge algorithm of your QuiQ charger. Check out the LiftPod at the 29th Annual National VPPPA Conference on August 26 – 29, 2013 in Nashville, TN. Stop by and visit booth 918! We are planning to update the JLG® Ground Support phone system so we can serve you better. You are invited to take part in a brief survey about this phone system. Your feedback is very important and will influence the changes we make. Take our short survey and enter to win JLG merchandise! Congratulations to Brock D. Adams of Cleveland Brothers Equipment Co., winner of the July merchandise giveaway! Thanks to everyone who participated. Test your JLG knowledge in this month’s round of questions and enter to win JLG merchandise.